Soft and lacy, the Koume Patterned Japanese Tissue Paper features a burned out blossom lace with a weight of 17 GSM. 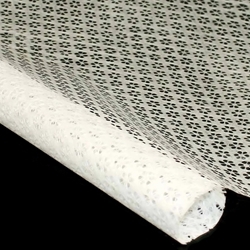 Made from Rayon this lightweight paper is perfect for all types of crafts. Light as a feather, this tissue weight paper is strong yet soft and luxurious. Use this paper for any application requiring a lightweight, translucent paper such as collage, lampshades and notecards. Available in two sizes: 8.5" x 11" and 21" x 31"
A comparison of Japanese Lace Washi Papers offered by www.MulberryPaperAndMore.com. These papers include Japanese Ogura Lace Paper, Sudare Paper, Uzumaki Paper, Hemp Flower Paper and others. Buy just 1 sheet or 100 in sizes ranging from 8.5" x 11" to 21" x 31".